A team of University of Pennsylvania engineers has used a pattern of nanoantennas to develop a new way of turning infrared light into mechanical action. It is claimed the development could lead to more sensitive infrared cameras and more compact chemical-analysis techniques. The research, published in Nano Letters, was conducted by assistant professor Ertugrul Cubukcu and postdoctoral researcher Fei Yi, along with graduate students Hai Zhu and Jason C. Reed, all of the Department of Material Science and Engineering in Penn’s School of Engineering and Applied Science. Detecting light in the mid-infrared range is important for applications like night-vision cameras, but it can also be used to perform spectroscopy, a technique that scatters light over a substance to infer its chemical composition. Existing infrared detectors use cryogenically cooled semiconductors, or thermal detectors known as microbolometers, in which changes in electrical resistance can be correlated to temperatures. These techniques have their own advantages, but both need expensive, bulky equipment to be sensitive enough for spectroscopy applications. 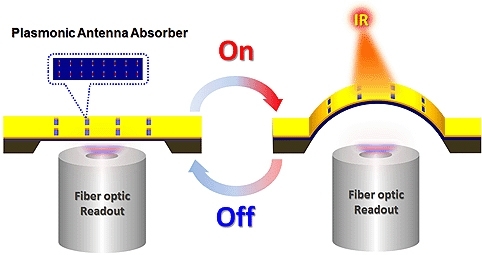 The advantage to this approach is that it could reduce the footprint of an infrared sensing device to something that would fit on a disposable silicon chip. The researchers fabricated such a device in their study. At the core of the device is a nanoscale structure made of a layer of gold bonded to a layer of silicon nitride. The researchers chose these materials because of their different thermal expansion coefficients. Because metals will naturally convert some energy from infrared light into heat, researchers can connect the amount the material expands to the amount of infrared light hitting it. To measure this movement, the researchers used a fibre interferometer. A fibre optic cable pointed upward at this system bounces light off the underside of the silicon nitride layer, enabling the researchers to determine how far the structure has bent upwards. Other researchers have developed optomechanical infrared sensors based on this principle, but their sensitivities have been comparatively low. The Penn team’s device is an improvement in this regard due to the inclusion of ‘slot’ nanoantennas, cavities that are etched into the gold layer at intervals that correspond to wavelengths of mid-infrared light. While only a proof-of-concept at this stage, future research will demonstrate the device’s capabilities as a low-cost way of analyzing individual proteins and gas molecules.